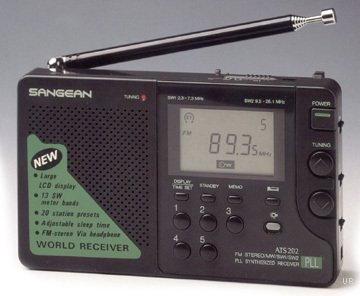 The Sangean ATS-202 is a compact portable receiver that tunes AM from 520-1710 kHz, shortwave in two bands from 2300-7300 kHz and 9500-26100 kHz plus FM from 87.5-108 MHz. FM stereo is provided to the headphone jack. Store your 20 favorite stations in the memories. Other features include: Mono/Stereo Switch, lock switch, dial lamp switch and tone switch. There is also a built in 24 hour lock function with sleep timer. 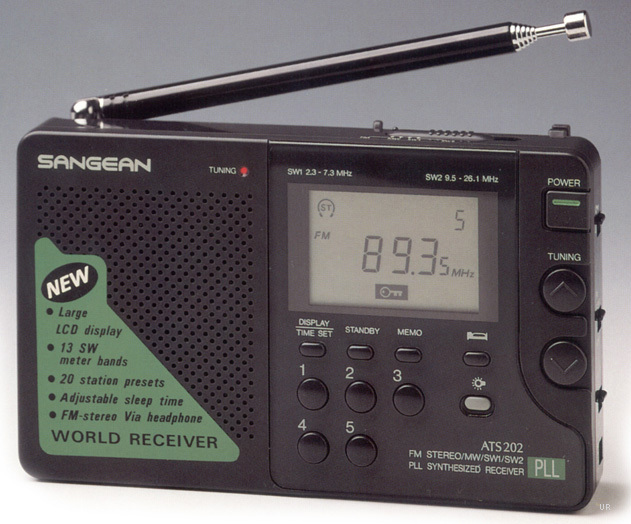 The AM band frequency step may be set at 9 or 10 kHz. The ATS-202 requires two AA cells (not supplied). This radio has a 2 inch 8 ohm speaker. There is an external power jack for an external 3 VDC power adapter. 5.25 x 3 x 1 inches 10 oz.